A look at how the Floating Hospital launched a new era in pediatric care. When a barge named the Clifford cast off from a pier in East Boston on a summer day in 1894, it launched a new era in pediatric medical care. Carrying low-income mothers and their sick young children for a restorative trip in the fresh ocean air, the ship soon became known as Boston’s Floating Hospital (or the Floating, for short). 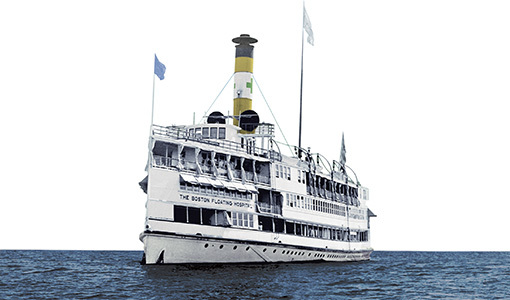 Aboard the maritime infirmary—and later, on land—doctors, nurses, and scientists not only cared for generations of ailing children and trained hundreds of students from Tufts University School of Medicine, but conducted research and developed new thinking about treating pint-size patients. “I don’t think people are aware of just how innovative the Floating was,” said Errol Norwitz, medical school professor and chair of obstetrics and gynecology at Tufts Medical Center. Ahead, a look at the discoveries and polices at sea. PARENTS WELCOME The Floating allowed parents to stay with their sick children, “which represented quite a different philosophy about poor parents, and what their abilities were,” Norwitz said. “The doctors and nurses didn’t look down on them. They saw them as important partners in the health-care system.” That attitude also extended to teaching mothers how to care for their children after they disembarked. GOT MILK? Doctors at the Floating Hospital believed breast milk was optimum infant nutrition, especially for ill or failing babies. So it’s no surprise that by 1910, the hospital had established the first human-milk bank in the country, stocked with donations from nursing mothers, or from women who had lost their children. Staffers also dried and powdered the milk, so it would keep during hot summers in the era before widespread refrigeration. FORMULA ONE Floating Hospital researchers also developed the first artificial formula, which came to be known as Similac. “It was never intended to replace breast milk,” Norwitz said, but it did fill a need when a mother’s supply was low or lacking. Designed to be more nutritious than cow’s milk, formula was the safer alternative in the days before mandatory pasteurization.